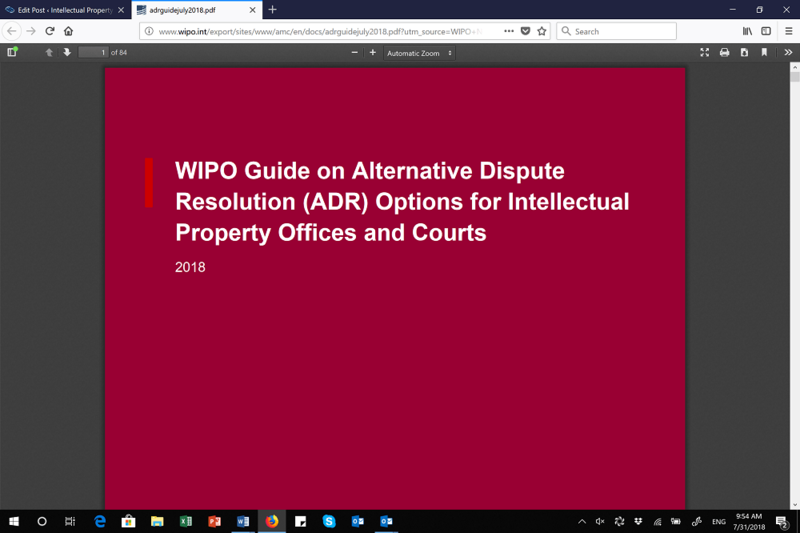 The World Intellectual Property Organization Arbitration and Mediation Center has released an updated guide providing an overview of alternative dispute resolution (ADR) processes for intellectual property disputes. The guide provides instructions on how to use the ADR process that has helped resolve tens of thousands of legal disputes outside of the courts. The 84-page WIPO Guide on ADR Options for Intellectual Property Offices and Courts can be found here. The author is Joyce Tan, a practicing attorney in Singapore with a long affiliation with WIPO. The Korean Intellectual Property Office provided funding for the project. General information about ADR is available on the WIPO website here. Towards the end of the 1980s, as a result of the 1976 Pound Conference that allowed governments to create the “multi-door courthouse” system, there was a substantial amount of arbitration disputes, the guide illustrated. In the area of intellectual property, alternative dispute resolution (ADR) procedures were rarely used since intellectual property “had traditionally been regarded primarily as a means to exclude or limit others from using certain protected subject matter, through litigation if necessary,” according to an account on the WIPO website. Since intellectual property was beginning to become an essential part of business, businesses started looking at less expensive, alternative methods to settle disputes, WIPO said. In recognition of this growing ADR market, international organisations informally gathered to settle disputes without litigation, and in 1994, WIPO created the WIPO Arbitration and Mediation Center (AMC). ADR has been used as a way to avoid litigation, according to the guide. The guide lists the advantages ADR provides, and what benefits IPOs gain when institutionalizing ADR centres. Other sections of the guide provide detailed descriptions of how ADR procedures are used in IP disputes. The guide provides information on general trends and landscapes of ADR, different approaches to ADR, and the three common types of ADR: mediation, expert determination, and arbitration. The final chapter suggests detailed ways for courts and IPOs to begin institutionalizing ADR formally. From raising funds to marketing, the guide provides instruction on how courts and IPOs may create ADR centres and keep the centres operating. In the appendix, the guide demonstrates how some IPOs have already begun to institutionalize ADR and incorporate some ADR processes into practice. Party Autonomy – ADR procedures in IP disputes provides tailored processes and results, it says. Litigation is often a fixed and inflexible procedure. The guide states that ADR provides flexibility so that disputing parties may have more control over the ADR process. “Parties can agree to meet at a neutral location, submit to a neutral expert of their choosing, and abide by rules and procedures that they have modified to meet their needs,” the author notes. Single Process; Jurisdictional Neutrality – ADR procedures centralize the process in one jurisdiction, according to the guide. If parties of different jurisdictions were to pursue the litigation route, there might be some prejudice in one or another jurisdiction. In ADR, parties are able to participate in jurisdictional neutrality. “Jurisdictional neutrality gives ADR processes a clear advantage over litigation for cross-border intellectual property disputes,” it says. Independent Specialized Expertise – With autonomy, disputing parties are able to consensually choose a neutral third party to guide their dispute, according to the guide. Often enough, the chosen mediator or arbitrator is an expert in the topic at hand. A third-party expert is less likely to be present in a courtroom to guide a litigation. “When capable experts are appointed, ADR processes offer benefits that would be otherwise unavailable through litigation,” the guide states. Simplicity, Flexibility – Compared to litigation, ADR is procedurally simpler and more flexible, according to the guide. In ADR, the disputing parties are able to set the rules and parameters themselves before beginning arbitration or mediation. The guide asserts that in mediation, strict legal positions are no longer the focus. Instead, each party is able to focus on the shared interests. Time Savings – Occasionally in patent litigation, IP rights that exist for a limited duration expire before a case is decided, according to the guide. In ADR, the guide explains that the process is much quicker, especially when evidence procedures are simplified. Cost Savings – Litigation in IP disputes can get costly, especially if either party is unsatisfied with results then decides to appeal a judgment, according to the guide. ADR in IP provides the opportunity for parties to save on time which translates to saving on cost, according to the guide. Confidentiality – Litigation and the discovery process can force a party to disclose sensitive information. ADR provides a way for parties to withhold any information that may be a trade secret, unlike litigation, the guide says. “Proprietary information can be kept confidential through agreements between the parties, and arbitrators can issue protective orders to prevent parties from accessing confidential documents,” it states. In addition, ADR processes and decisions are often not open to the general public, it adds. Finality – In general, the decisions that result from ADR processes are binding, according to the guide. The finality serves as an advantage because final decisions made after an arbitration, for example, are less likely to be overturned or challenged when compared to legal judgments. Diverse Solutions – The guide lays out how ADR provides a wide range of solutions for disputing parties. In mediation, parties work to negotiate a win-win solution, where in litigation there is one winner and one loser, it points out. In arbitration, disputing parties can set scope and limits of the arbitration. The guide notes that ADR does have areas in which to improve. Today in ADR, transparency on standards, feedback and ethics in the field needs to be addressed, it says. For example, there has been a lack of objective transparency on standards, such as fees and administration. Public confidence being a pillar for the success of ADR, administrative decisions should be made transparent, it asserts. The guide provides further ideas to help IPOs and courts address, and solve, these issues. "Updated WIPO Guide On Alternative Dispute Resolution A Tool For IP Offices" by Intellectual Property Watch is licensed under a Creative Commons Attribution-NonCommercial-ShareAlike 4.0 International License.